Comments: A great mix of science fiction and ancient mythology. From the cover alone, it's easy to tell that Saint Legend isn't quite like the manga or American comics we've grown up with. With an obvious emphasis on realistic character designs (even in a fantasy setting) and bright, vivid coloring throughout the graphic novel, this is clearly something new to most North American readers. Thanks to ComicsOne, we now have quite a bit of Chinese comics to pick from, and statistically, there's a good chance if you buy any, they'll have something to do with Andy Seto. For more than twenty years, the man has been involved in the comic book industry - over in China, of course. His style grabs the eye with his skillful juxtaposition of fine, graceful lines put together to form brutal, action-packed martial arts scenes. This is a work like few others in English, and we all have ComicsOne to thank for bringing this series (and practically every other Kung-Fu Comic) to our shores. 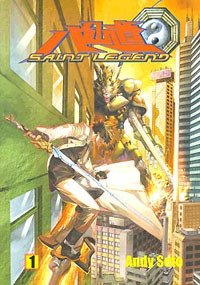 Saint Legend contains a story that has much in common with another title reviewed this month, The Story of the Tao. Set in the modern world rather than ancient China, mankind is once again undergoing a period of increasingly destructive chaos. Old beliefs and superstitions are being wiped out with alarming frequency, and strife seems to be becoming more and more common in the human world. Rather than see the shift away from spirituality as a simple step in the advancement of human consciousness, some people fear that an evil force is swiftly gaining in power, preparing to thrust the world into total chaos once and for all. That's where the Saints come in. Eight of the most enlightened immortals of Taoism join forces in order to seek out the source of the dark twist in human nature, each possessing incredible powers and age-old wisdom. As the story is strongly based upon Chinese history and legend, it's not surprising to find that this is a complex tale. Each character has an extensive background story, and it appears as if the first volume of Saint Legend barely scratches the surface of the world Andy Seto has created. There's more here, however, than just a complex story to dive into. Perhaps of more interest to a large portion of Saint Legend's fanbase, there's also some intricate fight choreography to enjoy here. Special moves are granted names, dramatically given mid-battle, and the authenticity of the martial arts presented is great enough to merit calling this genre "Kung-Fu Comics." Reading this series was quite a bit of fun, almost like watching a Kung-Fu movie with top-notch special effects. I suppose this is why The Matrix was so appealing. As with other ComicsOne releases of Hong Kong comics, I found the writing a little hard to get through. There are some noticeable problems with spelling and grammar, and the text doesn't always flow well. Everything sounds as if it's being read in English by a Chinese monk with a heavy accent. As I've mentioned before, this is a technical detail and can be easily fixed, but it is something that must be worked on for these series to gain the popularity they deserve. Saint Legend shares another technical quirk with The Story of the Tao, for there are times when the book reads from right to left rather than left to right. The majority of the title has been flipped to read left to right, so when some pages appear that don't conform to the same format, it becomes slightly hard to read. There are arrows when the reading order changes, but they aren't always obvious. As I've said before, the closest it can stay to the original work the better, but if you're going to change something, at least keep things uniform. I think there's a great story to tell here, and if the pace of the book could be picked up by smoothing out these technical speed bumps, then this would be a far more desirable release. Again, like The Story of the Tao, this book is published in full color at $13.95 - and it's in a nice large (7x10") format for our reading pleasure. The technical inadequacies noted before are all the more frustrating simply because this is an otherwise excellent version of an engaging illustrated series. Martial arts aficionados should get a kick out of Saint Legend, and if ComicsOne can increase the quality of their localizations, then many more people will enjoy the series as well. We'll just have to wait and see.